AJC hemming tools are just a part of our large metal roofing tool catalog. Offered in many widths and bend capabilities, and each crafted from heavy duty steel construction, we’re certain to have the tool you need. Featuring our narrowest profiles, the 11.25" hemming tool and 15.25" hemming tool both effectively create an up to 1" bend at the tops and bottoms of panels. Our larger profiles include the 17.25" and 20" hemming tool, each creating an up to 1.5" bend. 11.25" profile, used on metal roofs to bend the ends at top and bottom of panels. High quality steel construction. Up to 1" deep bend. This hemming tool has a 15.25-inch profile and is used on metal roofs to bend the ends at the top and bottom of panels. 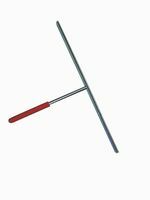 Our metal roofing hemming tool is made of high quality steel construction and has up to a 1-inch-deep bend. 17.25" profile, used on metal roofs to bend the ends at top and bottom of panels. High quality steel construction. Up to 1.5" deep bend. 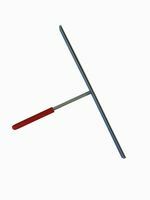 20" profile hemming tool, used on metal roofs to bend the ends at top and bottom of panels. High quality steel construction. Up to 1.5" deep bend.